Coyote Lake, Texas Panhandle natural salt lake. One of numerous natural salt lakes in the Texas Panhandle. Its waters, although brackish, have been welcome enough at various times to Indians, buffalo hunters, and thirsty cattle on hot, dry days. The lake, having a shoreline of over six and a half miles and a bed area of 829 acres, is one of the largest of the many saline lakes in the region. In early days, the Comanches were masters of this area, but after the 1874 Battle of Adobe Walls, they no longer hindered settlement of the Staked Plains. Today, artifacts found near the lake shore show that this was once a favorite Comanche camp site. 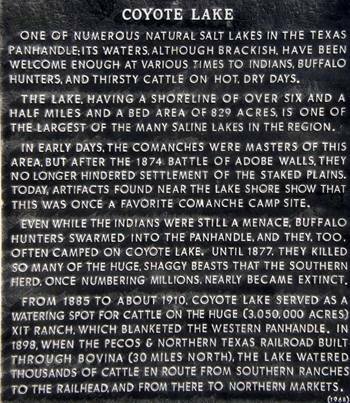 Even while Indians were still a menace, buffalo hunters swarmed into the Panhandle, and they, too, often camped on Coyote Lake. Until 1877, they killed so many of the huge, shaggy beasts that the southern herd, once numbering millions, nearly became extinct. 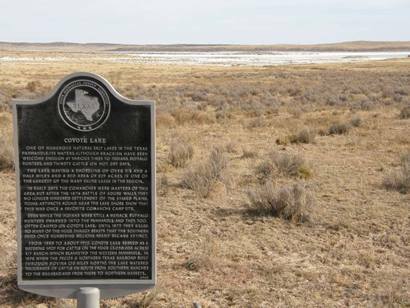 From 1885 to about 1910, Coyote Lake served as a watering spot for cattle on the huge (3,050,000 acres) XIT Ranch, which blanketed the western Panhandle. In 1898 when the Pecos and Northern Texas Railroad built through Bovina (30 miles north), the lake watered thousands of cattle en route from southern ranches to the railroad, and from there to northern markets.